Often when I find tools at flea markets, and I don’t know what they are for, I buy them. This one was particularly puzzling because it is so similar to a typeholder. 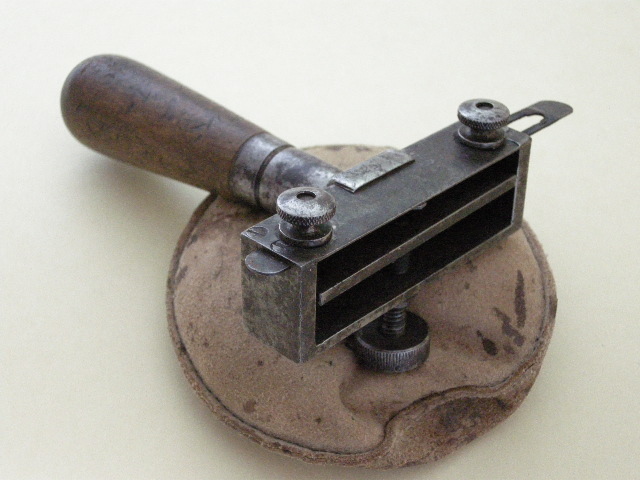 It must be a typeholder for something, perhaps rubber faced wood type? It is very well made, and the knob on the top adjusts for different font sizes. The ferrule is very strong and longer than I usually see. It seems made for standard, type high letters. The beveled area in the picture at the right suggests it was sighted from there. 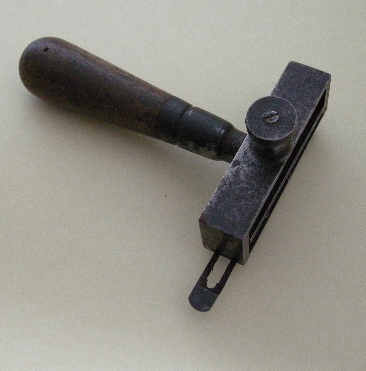 The adjustable guides are very thin, suggesting it was used with a hard type– either wood, metal or rubber tipped wood. There are no marks on the end of the handle so it was just used with hand pressure. The style of the knobs and attachment look early 20th C. I think the handle is beech. The only marking is a number “2” on the front right side. It is 128mm long and the main metal part is 82mm wide, and most of the steel parts 3mm thick.